Be the first to share your favorite memory, photo or story of Iris. This memorial page is dedicated for family, friends and future generations to celebrate the life of their loved one. 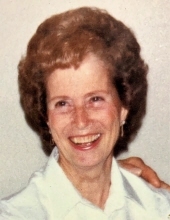 Chloe Brotherton, age 100, passed away Friday, April 12, 2019 in Fairfield, Texas. She was born to George Allen Huffman and Ola Mae (Mason) Huffman October 7, 1918 in Donie, Texas. She graduated from Donie High School in 1936, and later attended Massey Business College in Houston. She met and later married Joe Ernest Brotherton December 23, 1937. To this union was born one daughter, Linda. She was a member of First Baptist Church of Buffalo, Texas; a fifty-six year member of Pasadena, Texas Chapter of the Eastern Star and a long-time member of the 5F Club of Freestone. Her hobbies were gardening, reading, fishing and cooking. She was preceded in death by her parents; beloved husband of seventy-seven years, Joe Brotherton; sisters, Ruth Plummer, Mavis Shelton and June Spruiell and brothers, Clayton Huffman, George Huffman, Jr., Dale Huffman, Howard Huffman and Kenneth Huffman. Chloe is survived by daughter, Linda Lakenmacher; grandsons, Mitch Williams and Mason Williams; great-grandchildren, Mason, Jr., Christina, Natalie and Jarren and brothers, James Huffman and Harvey Huffman and wife, Nell. Funeral services will be held at First Baptist Church in Buffalo, Texas April 15, 2019 at 11 A.M. Bro. Alan Grisham, pastor of the church, will officiate the service. Burial will follow in Union Cemetery. A brief visitation will take place at the church before the service Monday from 10 A.M. to 11 A.M.
To send flowers or a remembrance gift to the family of Iris "Chloe" Brotherton, please visit our Tribute Store. "Email Address" would like to share the life celebration of Iris "Chloe" Brotherton. Click on the "link" to go to share a favorite memory or leave a condolence message for the family.